There is an unwelcome visitor in my coop. All of this picking and pecking led me to do a deeper investigation this evening, and what I discovered horrified me. I have mites in the coop. As a new chicken owner, I couldn't fathom how they got there, but I have been assured by the friendly folks at the feed co-op that wild birds (yes, those lovely cardinals and bluebirds I adore) share them with the hens. So I am now preparing to fight the battle. It will begin tomorrow night with diatomaceous earth. 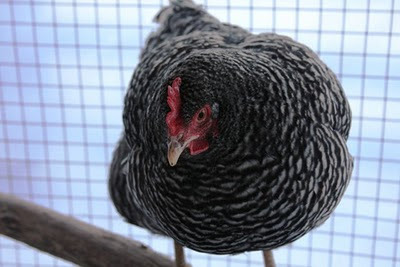 Taking each hen, I will encase her in a pillow case filled with diatomaceous earth and in the words of the fellow at the feed co-op "Shake and Bake them". Coating each hen with this fine powder, which will hopefully begin the process of killing off the mites. Step two will be to remove all of the existing wood chips, and spray the hen house down with ivermectin spray. Ensuring it gets into all of the nooks and crannies. (Ivermectin is a broad range antiparasitic medicine.) Each hen will also get a drop of Ivermectin on the back of her neck. Then, I will re-fill the hen house with new wood chips and another liberal dose of diatomaceous earth. Diatomaceous earth is food grade and safe. In fact it is probably the most effective naturally occurring protective powder on earth. It is taken from a geological deposit made up of the fossilized skeletons of marine and fresh water organisms, particularly diatoms and other algae. These skeletons are made of hydrated amorphous silica or opal. When crushed, they break up into tiny pieces of "glass'' (so tiny and fine that the diatomaceous earth feels like talcum powder). This is easily picked up by the hairy bodies of most Insects - whereupon it scratches through their protective wax layers; and they also absorb some of this material. The result being that the insects lose water rapidly and dry up to die. It's the Ivermectin spray I worry about. So for 7 days we will not be selling eggs from the coop. I can't in good conscience sell eggs that I wouldn't want to eat myself! My customers will be very disappointed - but I am quite certain that they too would want the hens restored to their former happy selves. Wish me luck with this battle!